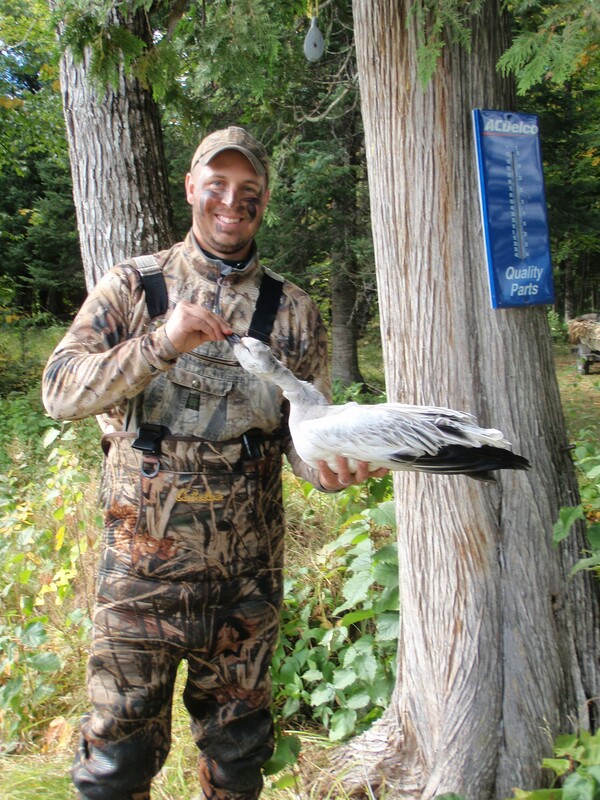 Pete Wyckoff’s first snow goose, taken in the Upper Peninsula of Michigan! Part of the Quacker Wacker Team had the opportunity to hunt the western Upper Peninsula for the season opener. We arrived in the middle of the night on Thursday, September 21st and grouse hunted Friday morning, yielding one bird. Friday afternoon was spent scouting the marsh and developing a game plan for the opening morning hunt. With the opener as early as it was, there were not many birds congregated in the marsh that we hunt. In the first half hour we picked up two birds and ended with five for the day. It was a pretty slow hunt, but we did well compared to the number of birds in the area. Sunday blessed us with the opportunity to take a rare snow goose. It was a great camp with 9 attendees, 6 who hunted ducks and two who hunted deer for the youth season. It was a great weekend with incredible food provided by the camp host! Each year I offer to guide some young hunters on a duck hunt during Michigan’s two day youth hunt. This hunt is a great opportunity to teach the next generation of duck hunters how to ethically and successfully harvest waterfowl. 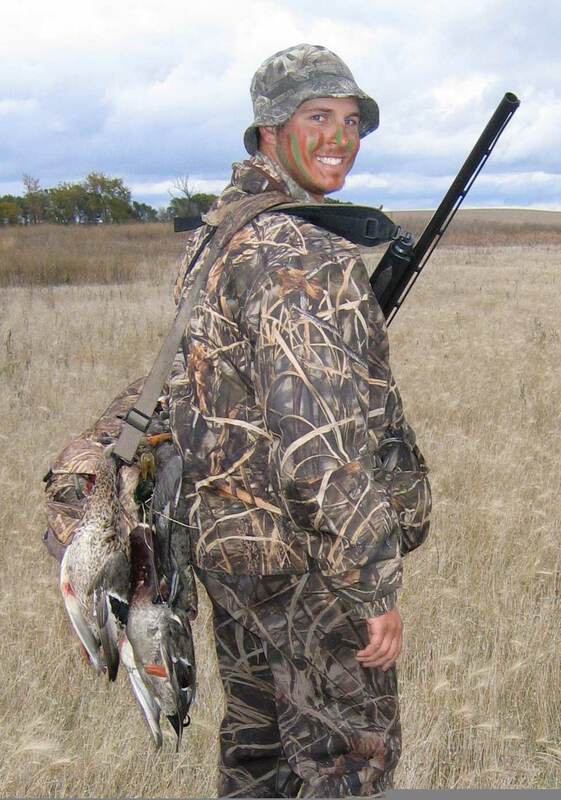 I take the kids to a nearby state game area that is managed for waterfowl. Last year I had two of my cousins’ kids on the youth hunt. Both kids were excited to have the opportunity at one of the premier waterfowl management areas in Michigan. We started the day by attending the pre-hunt draw to choose our hunting zones. After drawing third to last, we headed out to our zone. The zone we chose was in a scramble area without delineated hunting areas – the first one to a spot gets the spot. Since we were drawn so late, we were limited on where we could hunt since most of the good spots were already taken. When setting up, try to allow at least 100 yards between you and the next party. The greater the distance the less influence you will have on each others birds when they are working. Don’t shoot until hunting time has been called by the hunt leader. Respect your shooting lanes when the hunt begins. Don’t shoot at a bird that would cause you to be shooting over someone’s head. Don’t shoot behind you because that is where the adults will be standing. Only shoot healthy birds in the air. They are more exposed and offer a more vulnerable target. If a crippled bird is on the water, don’t shoot if the dog is near. Wait until all dogs and hunters are clear before finishing off a cripple. Wait for the hunt leader to call the shots. Shooting too early can be frustrating for yourself and for other hunters. 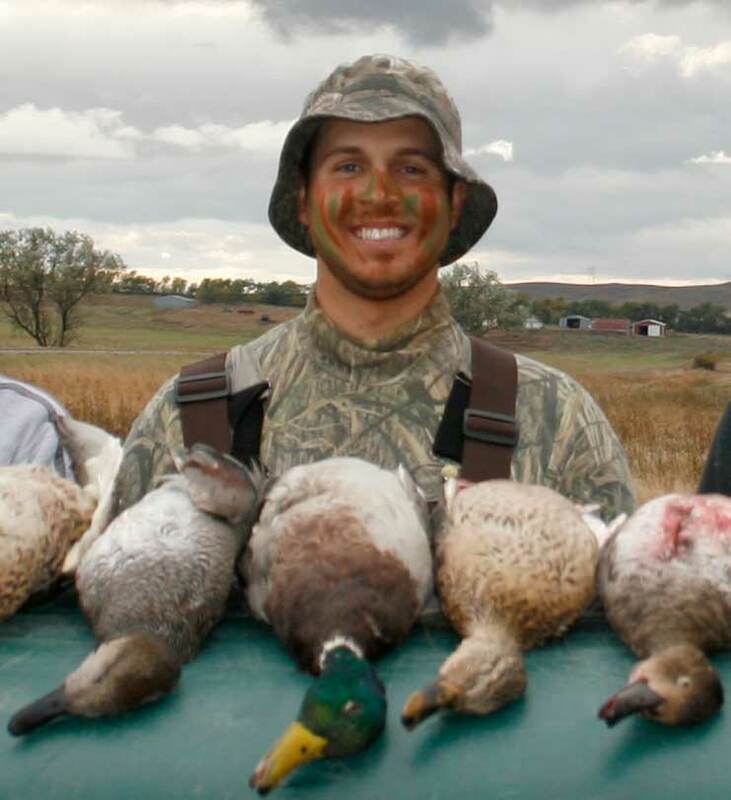 Try to identify the ducks before you take your shot. The hunt leader will call out the species when he calls the shot. Identification is key to staying within the legal daily bag limit. The kids were excited and understood the rules of the hunt as shooting time was quickly approaching. The morning started off with a bang as the first bird came in and was dispatched with one shot. The youngster had just shot his first ringneck. He was as excited as I’ve ever seen him. The following hour included about 20 shots between the two kids and no birds to show for them. The other youth decided to set up in a different spot and try to get some birds that were working a different area. This was a good decision as it yielded a large black duck. By ten in the morning, both kids had expended their 25 shell allotment and each had one duck to show for it. They had a great hunt even though they didn’t shoot well. At the end of the hunt, I took the group to a nearby wetland restoration completed by Ducks Unlimited in coordination with the Michigan Department of Natural Resources. When we arrived at the site, I explained the importance of continuing to restore wetlands and create more wetland habitat for waterfowl. 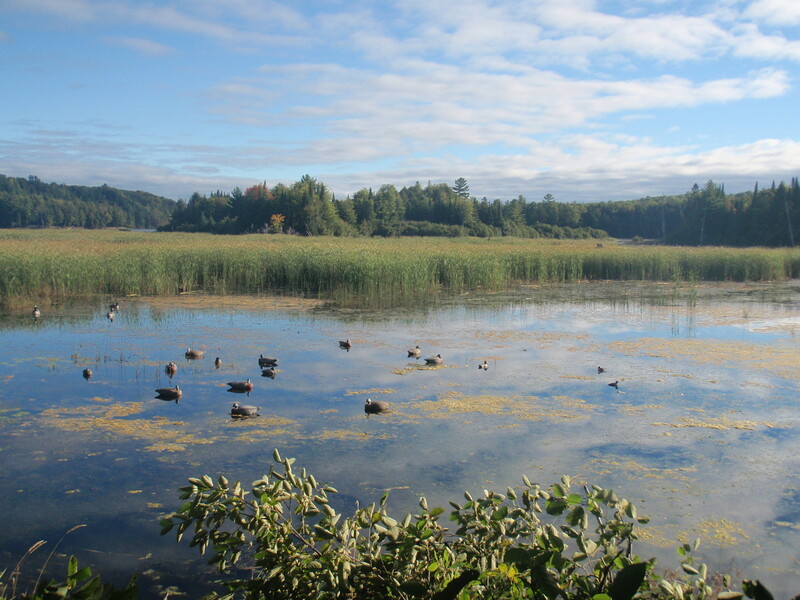 By creating waterfowl habitat, we are taking steps to ensure that future generations can recreationally enjoy the wildlife that use these habitats. When we arrived at the two year old site, we were greeted with over 150 mallards and more than 50 geese on a 26 acre impoundment. The state of Michigan has multiple opening days each year. Sometimes we are lucky enough to have three opening days, but sometimes we have only two. 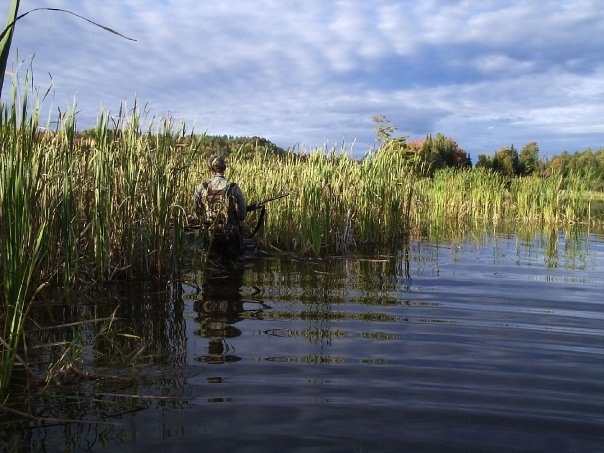 This gives motivated hunters an opportunity to experience the best puddle duck hunting in Michigan over the course of multiple weekends. What better way to start the duck season than to hunt for two or three consecutive weekends and the birds are just as dumb each time you go out? My uncle has a cabin in the heart of a national forest in the Upper Peninsula of Michigan (UP). The UP always has a different opening day than the southern lower peninsula, which is where I reside. A few years ago, my uncle invited some of us “trolls” up for the UP opener. Ecstatic, my cousin and I drove up on a Thursday, hunted grouse on Friday and then ducks for opening morning. This trip has become a tradition for my family and it has been permanently placed on our calendars for the foreseeable future. Not only do we enjoy the phenomenal duck hunting opening morning, but we experience unequalled grouse hunting with around 40 flushes per full day of hunting. Our family motto is “The family that hunts together, stays together!” It would take a life changing event to prevent our family members from reconvening each fall to share the woods and the blind with our extended family. This year my mom, two uncles and one cousin all made the trip to the UP for the opener. The weekend started with disappointment when we found out that the road that led to our 4 best grouse spots was closed by the forest service. We spent more time driving and less time hunting than normal on Friday, but still produced six grouse and two woodcock – which are better numbers than we traditionally have done. 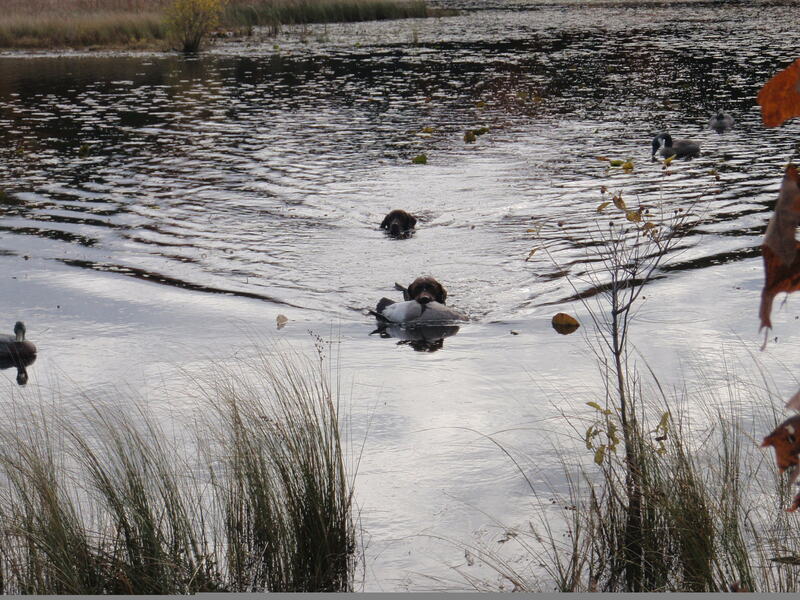 After a big dinner, we scouted for the evening flight of ducks and laid out the plan for the following morning. We arrived at our spot and were setup with a few minutes to spare. Low hanging cloud cover provided minimal visibility. The ducks didn’t start flying until 15 minutes after shooting time. The next ten minutes were a flurry of activity that resulted in ten birds in the bag. By the time 10:00 am hit, we had 22 ducks in the bag for the five of us. My cousin and I each had limited out and the old people picked up the other ten birds. The morning hunt provided a mixed bag of greenwing teal, bluewing teal, wood ducks, mallards, black ducks, and wigeon. We called it a day and chased grouse and woodcock for the rest of the day. We setup Sunday for the second day shoot and picked up four more mallards and a canada goose before packing it up to head back to the south for two more weeks of work before our zone opened up. When I told my uncles that my wife and I are expecting our first baby in February, the response was simply: “make sure you learn the spots up here so you can bring your son when he gets old enough.” I simply smiled because I know that the opportunities provided by my relatives are because they are more proud of the success of the next generation than their own success. My mother and uncles are almost as excited as I am to see my son take his first bird 11 years from now when he can start hunting. It’s not about how many or how big your trophy is, it’s about enjoying natural renewable resources and passing on the family traditions that have kept your family strong through the tough times. Thank you to my grandfathers, parents and uncles for passing on the tradition of hunting and teaching me the importance of family and the traditions that we hold. A lack of strong weather fronts midseason failed to drive the ducks into Michigan similar to past seasons. Significant hunting effort was rewarded with few ducks through the month of November and the first weekend of December. I use a lake near my house which receives little to no hunting pressure as a barometer for the migration. Unfortunately this year, the lake held no more than the 20 local mallards that live in front of the houses around the lake. In normal migration years, this lake will fill up with 400 to 500 ducks, mostly divers and mallards. Although these numbers don’t usually lead to a fantastic hunt, the increase in numbers is representative of the migration and the increases that occur in areas that will sustain thousands of ducks during the peak of the migration. This year the ducks didn’t show up on my “barometer lake” until two days after the main Michigan season had closed. As I have observed this lake over the past three years, the ducks show up on this lake when the pile into the better hunting areas. We now have ice on all of the smaller lakes and will likely be frozen shut with the exception of some rivers before we get our last chance at ducks in Michigan – the two day late season. Although hunting in the late season usually produces a plethora of mallards, the main migration of divers and puddle ducks seems to have missed our hunting season dates this year. This is frustrating for hunters across Michigan who hunted hard all season long only to watch the birds pass us by when the season is closed. One thing that no one can predict in August when the regulations are set is when the weather fronts will push the migrating ducks in our favorite honey holes.